It started with a short, sharp email transmitted by a cell phone. The email came from Dave Whalley, former professional guide and past president of KW Flyfishers, the local fly angling club based in Waterloo Region, which straddles the Grand River, a designated Canadian Heritage River. The subject line was promising: Fishing Tomorrow. When I returned the call, Dave asked if I had plans. ’Nothing,’ I replied. My partner Lois was in England on a choir tour of hallowed cathedrals. I was alone with our two girls — nine-year-old Labradoodles who are sisters from the same litter. Dave invited me to join him for a muskie and bass outing from his drift boat on a river a couple of hours’ drive from Kitchener-Waterloo. 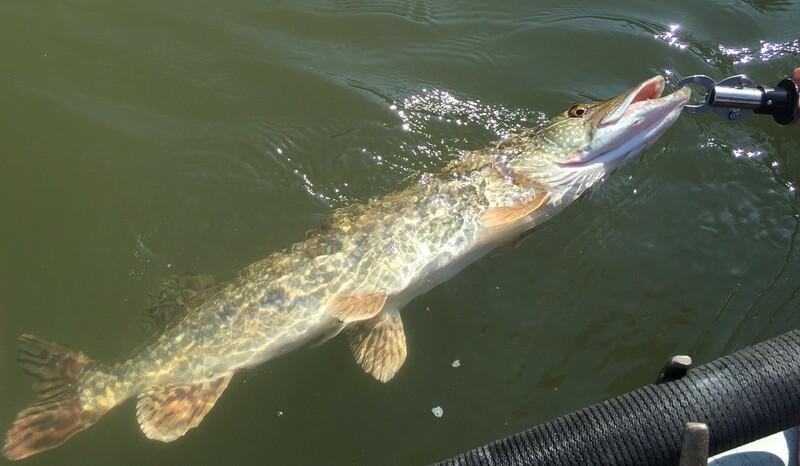 I confirmed I would to be happy to tag along, adding I had never fished from a drift boat or targeted muskellunge, a goliath of a fish whose home is confined to the Great Lakes region. Its name originated in the late 18th century and is derived from the Canadian French maskinongé and from the Ojibwa māskinōs̆ē. ‘It isn’t,’ I said, fibbing through clenched teeth. My concealed consternation needs explaining. Meeting at 6 am means getting up at 4:30. I know that lots of good people other than farmers rise and shine before sunrise. But not me. A chronic insomniac since my university days in the early 1970s, I also suffer from sleep apnea. I rarely, if ever, get up before 8 am. To exacerbate matters, I can’t leave the house without a morning shower, which takes a good half hour — a quirky symptom of Tourette’s syndrome. We met at a designated location and headed out on a lonely two-lane amid the darkness and the fog. We arrived at our destination about 8 a.m., just as the sun was burning the mist off the river, put in the drift boat and started casting ‘fuzz and feather’ (so named by the late, great American outdoor writer Charley Waterman). Now, my preferred fish is trout. Hatchery raised browns and rainbows are fine, but catching native brook trout, which were called speckled trout or specks when I first encountered them in Northern Ontario as a youngster, is as close to Paradise as I can get while rooted in this fragile earth. I also enjoy fishing for largemouth and smallmouth bass. I cast trout flies on three, four or five-weight rods for proficient distances. Here, accuracy and finesse are more important than distance. I cast a six-weight with small streamers, usually woolly buggers, well enough to catch my share of bass. But to cast a 10-weight rod and line with muskie flies takes me out of my comfort zone. Dave had rigged up one of Steve May’s Quarter Chicken muskie flies. Steve is an innovative commercial fly tier, professional guide and angling writer who introduced me to the sport a few years ago, for which I’m deeply grateful. The provocatively named fly is made from various synthetic materials, with a rattle, rotating joint, big nasty hook and other sundry doodads. Casting it is like heaving a size 12 rubber boot tied to the end of butcher string — at least for me. Still, I persevered, determined not to be defeated during my inaugural drift boat adventure. I was casting far less than the desired distances. Dave is a superb caster whose effortless casts propel large gaudy awkward flies to optimum distances. 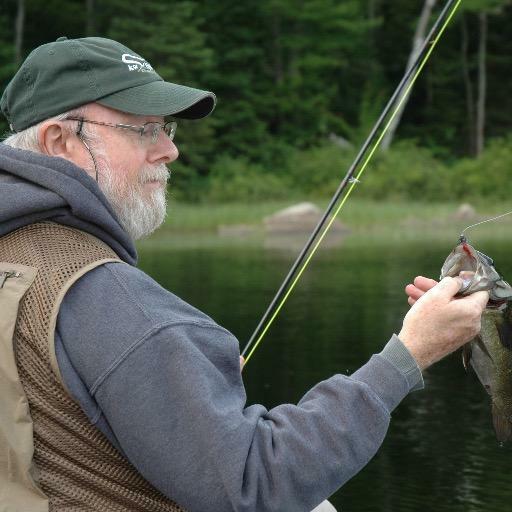 He’s also generous when it comes to sharing what he has learned over a lifetime of fishing. He doesn’t ruffle easily. He’s low key and casual, with a ready smile. In short, he offered sage advice, with a demonstration of how I could improve my casting. It’s all in the rhythm and timing, you see. I listened dutifully and watched intently with no noticeable improvement. I was unable to duplicate Dave’s form, let alone rhythm and timing. 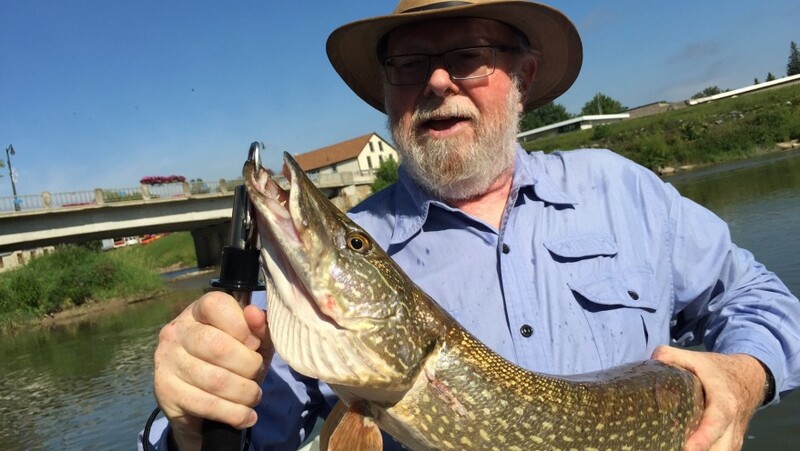 My bungling, however, didn’t prevent me from hooking a great Northern Pike. It wasn’t a muskie, but it was still the biggest brute I have ever caught fly fishing. I would like to report that he fought like a dervish, a fish possessed — Captain Ahab’s mythic White Whale incarnate in a lazy, hazy river at the height of summer. Something to delight Roderick Haig-Brown, the fly fishing god who knew a thing or two about big salmon on the West Coast before proposed pipelines threatened ecological catastrophe. But it was more heavy, sluggish dead-weight than ferocious fight. There’s more actual fight in a gorgeous six-inch speck or a feisty nine-inch smallmouth bass than in a big ugly muskie. Nonetheless, I caught the Mighty Leviathan (that’s Pike Talk for a fish of respectable size) about 9:15 am. To put the time of day in perspective, that’s usually when I’m sipping my first coffee after downing four ounces of kefir (a sour-tasting drink made from fermented cow’s milk, which Lois swears is good for the ol’ gut). Dave helped me land the pike using a powerful pair of clippers that held fast to the creature’s sinisterly toothy yap. I took a few photos of the beast on Dave’s cell phone while it languished alongside the boat. You could tell he was pissed, biding his time to get even. I consistently forget to bring along the pocket-size waterproof Pentax I purchased to record such personally momentous events. Dave eventually lifted it out of the water and passed it over for a couple of quick photos before reviving it, allowing the brooding monster to return to the dark, muddy subaquatic world out of which it came to provide a memorable thrill for an impressionable fly angler. One of my most prized possessions is a photo of my two sons sitting in a 14-foot aluminum boat after an evening of fishing with their dad. Dylan, my oldest who was about 10 at the time, is casually holding a bass by its mouth in the standard angling pose. Meanwhile, Robin, my youngest who was about seven, is struggling mightily to grip a big oily bass by its tail. I resemble Robin more than Dylan, as I proudly show off my scarred veteran of the watery depths. Dave wouldn’t take any money from me for gas, acknowledging that it was a retirement gift. Thank you, Dave. I had retired five weeks earlier from the newspaper I worked at for three decades. He didn’t know it, but my 64th birthday had just passed as well. Just think, a retirement gift and a birthday present wrapped in one prehistoric snarl. humility for when things go wrong, as they invariably do. grace for when things go right, as they sometimes do in defiance of the odds. gratitude for all the living things that inhabit our sacred earth, which the visionary poet William Blake acknowledged when he declared Everything That Lives is Holy.